Billy Pearce will lead the cast as Wishee Washee alongside Christopher Biggins, who takes up residence of the iconic laundry starring as Widow Twankey and Simon Webbe in the title role of Aladdin. 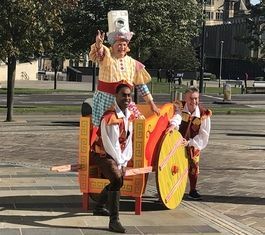 Aladdin marks Billy’s 20th Alhambra Theatre pantomime, an achievement marked earlier this year at the Welcome to Yorkshire conference staged at the Alhambra Theatre, where Billy became the second ever recipient of their Pride of Yorkshire award for his services to Bradford pantomime. Since making his Alhambra Theatre pantomime debut in 1993, Billy has topped the bill of the Alhambra Theatre’s annual festive production for 19 years, and in that time starred alongside a host of famous faces, winning acclaim from critics and audience members alike, and reinforcing his reputation as the stalwart of the annual Alhambra Theatre pantomime. Having established himself on the club circuit, quickly becoming one of the nation’s most talented comedians, Billy now entertains hundreds of thousands of people each year through his various stand-up gigs, television appearances and stage productions, his most recent of which include The Rocky Horror Show, the brand new comedy play Seriously Dead and The Wind in the Willows. He recently received the Services to Arts and Entertainment at the Yorkshire Awards, an accolade previously won by Sir Alan Ayckbourn and The Kaiser Chiefs. This will be Christopher Biggins 32nd pantomime appearance, and his 9th in Aladdin. A mainstay of entertainment for a number of decades, he made his pantomime debut aged just 17 in his home town of Salisbury before forging a highly successful career in show business. Best known for his numerous iconic television appearances, Biggins appeared opposite the late Ronnie Barker in the iconic BBC sitcom Porridge, held roles in Whatever Happened to the Likely Lads?, appeared alongside Michael Crawford in Some Mothers Do ‘Ave ‘Em and played Nero in the critically acclaimed dramatisation of I, Claudius. Despite his serious roles, and never one to not entertain, Biggins is also known for co-hosting Surprise, Surprise, and On Safari, appearing on numerous celebrity specials and as King of the Jungle having won ITV’s I’m a Celebrity…Get Me Out of Here! in 2007. On stage he has starred as The Baker in Joseph and the Amazing Technicolor Dreamcoat, played Herod in Jesus Christ Superstar (a role he also took for the film version where he starred alongside Donnie Osmond and Joan Collins), and the Baron in Chitty Chitty Bang Bang in the West End. He also narrated the live stage tour of The Rocky Horror Show, based on the cult film in which he also appeared. It is perhaps pantomime for which Biggins is best-known for and he has been entertaining thousands of festive theatregoers every year since he began his panto appearances in the mid-80s. From Glasgow to Plymouth, Biggins has donned a host of outrageous frocks and had audiences in stitches, starring alongside the likes of David Hasselhoff, Patsy Kensit, Simon Callow, Bonnie Langford, Cannon and Ball and even Basil Brush. Biggins last performed in pantomime at the Alhambra Theatre 30 years ago alongside The Krankies. Since joining the BRIT award-winning boy-band Blue in 2001, Simon Webbe and his band-mates went on to sell over 14 million records worldwide, releasing 5 critically acclaimed studio albums and headlining several UK tours. In 2011, to coincide with their 10th year in the music industry, Blue represented the UK in the Eurovision Song Contest with their entry I Can. Whilst Blue took a well-earned break, Simon released his own solo albums and singles. He also took to the West End stage in Sister Act the Musical, alongside Shelia Hancock and Whoopi Goldberg and Three Little Pigs at the Palace Theatre. Simon’s numerous television appearances include Strictly Come Dancing where he was a runner-up in the 2014 series; I’m a Celebrity…Get Me out Of Here! and ITV2’s The Big Reunion. In 2015 Simon made his pantomime debut for Qdos Entertainment starring as Aladdin opposite Christopher Biggins in Nottingham and since then has starred in Jack and the Beanstalk in Northampton and High Wycombe. This year’s pantomime will once again be produced by Qdos Entertainment, the world’s biggest pantomime producer and the same team behind the annual Alhambra Theatre panto for nearly 20 years. Aladdin will be directed by Ed Curtis, returning for his 7th consecutive Alhambra Theatre pantomime. With over 40,000 tickets already booked, audiences shouldn’t leave it any longer to secure their seats for this year’s must-see production, packed full of audience participation, 3D special effects, music, a wish-granting genie and plenty of panto magic!